When I’m out on a long backcountry adventure, I aim to consume around 3,000 calories per day. This means that if my food averages 100 calories per ounce, I’m toting roughly 2 pounds (30 ounces) of food per day. If I’m out on a two-week backpacking trip with no options for resupply, that quickly adds up to 25 pounds of grub. If my calorie/ounce averages less than that, then it starts to become a real issue. For example, if the average is only 75 calories/ounce, we’re talking 33 pounds! So what’s the best way to achieve that benchmark of 100 calories per ounce? Know which foods have the highest calories by weight! Fat contains the densest concentration of energy, more than twice that of carbohydrates and protein. Thus a heaping ounceful of pure fat sets the upper limit: 255 calories. 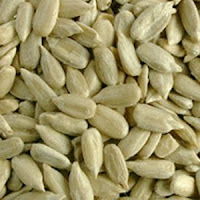 Next up are various seeds. Dried fruit—apricots, mangos, cherries, etc. 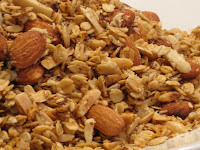 Finally, for breakfast, consider granola (120-150 calories/ounce) instead of oatmeal (80-100 calorie).